We know what it’s like. You come home after a long day at work, you’re not in the spirit of cooking up a storm and suddenly all you want is a takeaway. That might be why we’re seeing an increase in the market in food delivery boxes. Now smaller, niche players are getting in on the act, offering specific meal kits tailored to particular dietary preferences, food styles and health trends. We look at our top four diet food boxes. Calorie controlled gourmet diet; freshly prepared and delivered daily. Love Yourself box serves pre-made fresh, locally sourced seasonal products to your doorstep. 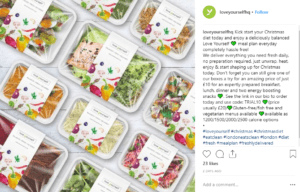 The Love Yourself subscription box allows you to choose your meals based off one of five categories: vegetarian, vegan, gluten free, balanced (meat, fish and veg) and an additional balanced option minus the fish but including the meat. So, everyone will find their ideal box and the food is excellent. The website even allows you to track your diet via the MyFitness App. 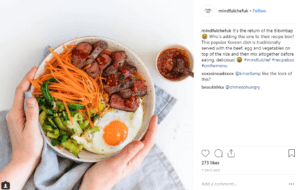 The creators of the UK’s very first vegan recipe box, Mindful Chef also caters to meat and fish diets using pre-portioned ingredients from sustainably sourced small British farms. Targeted towards nutritionally balanced diets, the recipe boxes can be delivered to your door once a week and provide the option of dishes for one, two or four people. Designed for the health conscious, Mindful Chef’s meals are free from dairy, gluten, refined carbs and refined sugars. They never deliver pasta, bread or white rice and instead all their recipes are based on innovative uses of fresh vegetables. Whether you’re looking to lose weight or simply eat healthily, The Pure Package’s tailored programmes can suit all needs and lifestyles. A team of experts will work closely with you to create your own plan and make sure it suits your lifestyle. Once the plan has been confirmed, the quota of healthy food is delivered daily, so there’s no need to plan meals, go food shopping or worry about portion control; every meal and snack is already prepared to be eaten and enjoyed by you. You can even enjoy a personal chef programme which will be completely tailored to your needs. 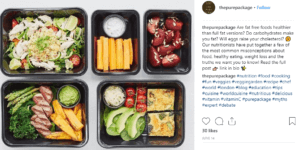 Plus, the luxury delivery box company is starting a campaign to combat pollution with nutrition, definitely one to watch! Choose from a one, three or four month plan which includes breakfast, lunch and dinner as well as a daily snack. The menu can be tailored to your own tastes, so you won’t be presented with any meals you don’t like. Dishes such as lasagne and thai chicken curry can be found and despite the plans being typically under 1200 calories per day, the portions are generous. There’s also a support service in place, so you get to speak to a qualified nutritionist at the beginning of the plan and during, whenever you need to. If you have a week where you go off track, the support service can help you to work out your next steps. Jane plan also provides wheat-free, gluten-free, dairy-free and halal diets. Could your brand do with a serving of PR or a communications strategy to launch a new campaign? Why not get in touch to find out how our award-winning consumer team can help you.